Due to a lack of interest, (on my part) in doing what it takes to lose weight, as of late...I'm taking a break from my "Losing it" Blog and have started a brand new one. This will be a more general blog, called, "The View From Grandma's Front Porch." You can get there by clicking HERE. Check it out, and once I get my motivation back...I'll resume this one, strictly as an account of my weight loss. Thanks! Catch ya on the flip-flop. 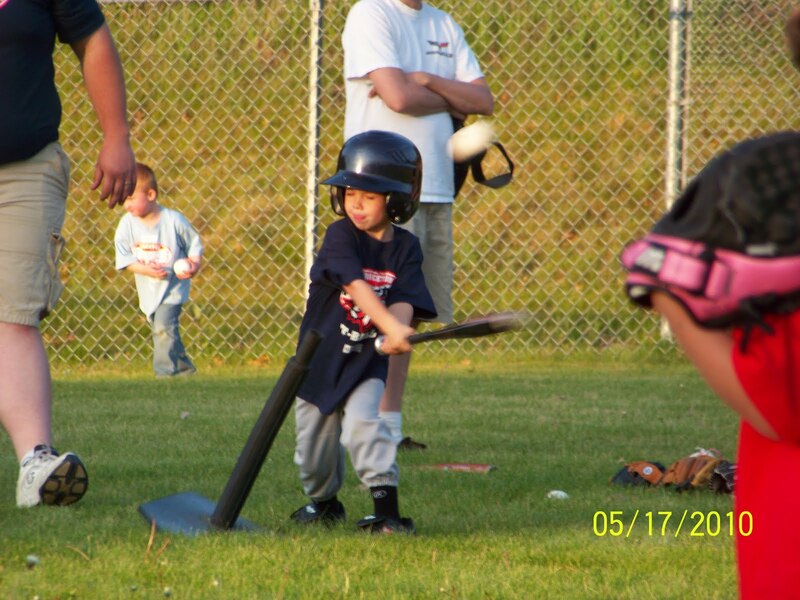 Wordless Wednesday #38 ~ "Dogged Determination"
CJ's first T-Ball game. 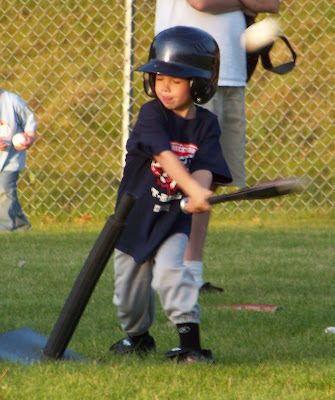 He's on a team called the Blue Dogs. Check out the closed eyes, and the tongue sticking out! Thanks, Ray! You Made My Day! 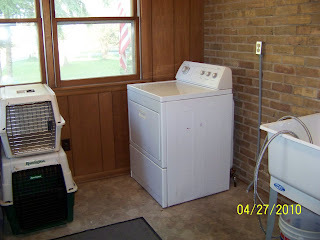 Earlier this year, the stackable washer/dryer we were using in our rented farm house, gave up the ghost. First the dryer, (after months of a very noisy squealing noise while in use), and then the washing machine decided it shouldn't have to work anymore either. I guess it figured if the dryer was retiring, they might as well go together. Anyway, for WEEKS now, we've been hauling about six loads of laundry to the local laundromat each week. That's only for 3 of us. If I did Jessica and CJ's too, it was more like nine loads. The washing machines cost $1.75 per load, and the dryers could be bribed to go a whole 8 minutes for a quarter. It was quite an expense, not to mention the chore of hauling it all out to a vehicle... and into the laundromat...and back to the vehicle... and into the house... Ugh! To say that I hated laundry day was a gross understatement. 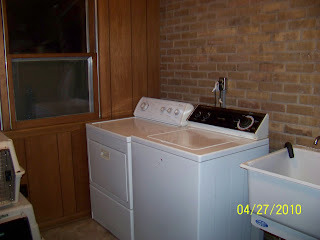 Some would say that it should have been the landlord's responsibility to repair or replace the appliances, but they've been very kind and patient with us, and besides, we had a perfectly good washer and dryer sitting out in one of the out-buildings here, from the house we lived in before. 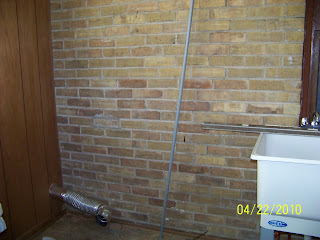 So...first of all, we had to move the freezer from this corner, to where the stackable unit had been, so we could vent the dryer out the wall. 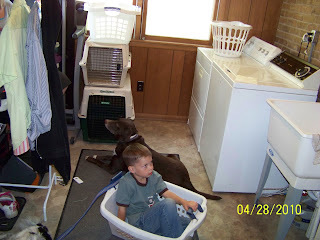 Then Ray bought a laundry tub, which he later assembled and installed. 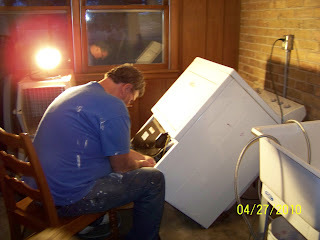 And a week after I took the first pics, he had the electricity, LP gas and plumbing all ready to go. There was even hot and cold running water in the laundry tub! Ray then hauled in the dryer, and I cleaned it up and set it in place, just to see what it would look like. It was finally starting to seem like this project might actually come together!! 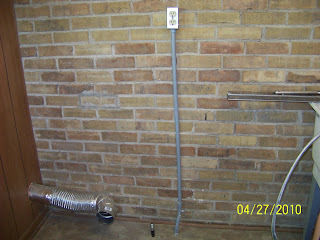 But first, my old dryer had to be converted from natural gas to LP. 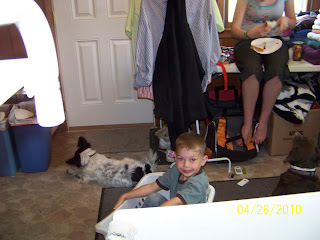 * My grandson, CJ thought it was a great place to hang out, and he (along with the two dogs) sat in there (in a laundry basket of course), watching cartoons for the remainder of the afternoon. And to top it all off, when Molly came home, she promptly made herself a PB&J sandwich and joined him in there. She's sitting on the table amongst the folded clothes...Silly kids. 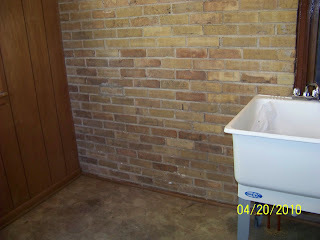 Oh, and if you're wondering how I took a picture from over the laundry tub...since this room was added after the rest of the house was built, there is a window between my laundry room and the living room. Quaint, don't you think? "360* Life - Ten Ways You Can Live More Richly, Deeply, Fully" by Billy Joe Daughtry ~ Book Review and Giveaway!! What if you only had a few days to live? Would you live differently than you do right now? The idea of a 360* life, is that we start with God, enter the world, touch others during our brief stay here, and then finally complete the circle to enter eternity with God! The really interesting thing about this book, is that the author did not live to see this book in print. Sadly, his own brief journey here on earth was over before it was published...which is in itself, a testimony to the fact that this earthly life, is only temporary. I took my time reading this book, and was once again struck by the way God chooses to get my attention while I'm reading...with everything else going on in my life at the same time, (He tends to do that a lot with me). One of the first times I sat down to read this book, I ended on page 65 where the 23rd Psalm is printed in its entirety. The very next day, I went to a tea party at church, (a REAL tea party, not one of those political ones), where the pastor's wife opened in prayer. She read us the 23rd Psalm! Of course many of us have heard that psalm numerous times in our lives...I was just struck by the "coincidental" timing of it. A couple of weeks ago, I started a new bible study, "Becoming More than Just a Good Bible Study Girl." The night before, I'd been reading page 21 in this book, about David and Goliath and "Rising Above Your Circumstances" and facing your own giants. There is a video that goes along with this study...yes, in the video that day, she talked about the story of David and Goliath. Imagine that. Chapter 6 is called "Hearing God's Voice" and talks about learning to hear His Still, Small Voice. The topic of our sermon LAST SUNDAY, was "Be Still and Know That I am God," and was about that very topic. In fact, on page 91 the book talks about 1Kings 19:12, where God sent a strong wind, a violent storm, an earthquake and finally a fire. God's voice was not contained in any of those things...but in a still small voice. Yup, that's what we heard on Sunday too. Coincidence?? As a matter of fact, I believe I'm going to read this book...one more time. I know there are things in it that I have already forgotten... My memory has never been great. If you would like a preview of this book, you can download the first chapter here. 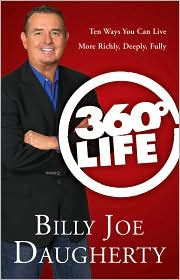 360* Life is available at WaterbrookMultnomah.com, BarnesandNoble.com and ChristianBook.com. I would also like to give you, my wonderful readers, an opportunity to win this excellent book. All you need to do, is leave a comment after this post. You can come back and leave one comment each day for more chances to win. I will do a random drawing on May 15, 2010. Make sure to leave me a valid e-mail address, so I can contact you in the event that you are the winner. Good Luck! Okay. It took a total stranger, to leave a comment on one of my posts today, and wish me a happy blogoversary, to alert me to the fact that it WAS my blogoversary! Thank you, Teena in Toronto! I knew that I had started some time in April, 2 years ago, but haven't really been posting a whole lot lately, and didn't remember the exact date. I'm not even exactly sure how Teena knew it WAS my blogoversary today. Unless she went all the way back to the beginning of my posts or something. I DID have a countdown thingy on here, but for some reason, it hasn't been updating correctly, and says there are 162 days to my 2nd blogoversary. Wordless Wednesday #37~March in Minnesota?? 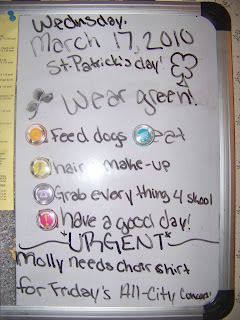 And she's been using this check-list daily, ever since then, changing the date and info each night. She's been getting herself up every morning, and has not missed the bus even once during that time. I used to have to bring her to school at LEAST once a week. Ray brought her to school this morning, but that was only so she could pick up some stuff for a lunch for her field trip today. Otherwise she's gotten on the bus every morning before 7AM. This is huge for her...and a welcome change. She's made some other steps in a positive direction too. Last Friday night, she offered to babysit for free for a young couple, so they could go out with us. She did say that "free will offerings" would be accepted...but I'm pretty sure she was joking. She also decided to join the Youth Drama Team at church, which I think she will really enjoy. She's always been a natural drama queen actress, and a very good narrator. I can't wait to see the skits they will put on. 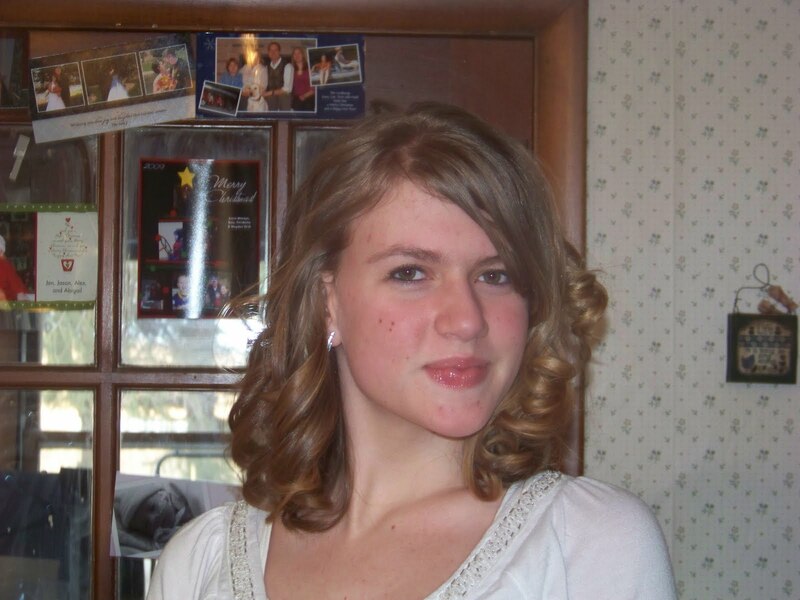 I'm very excited about these positive changes in my daughters life, and I hope that she will keep up the good work! Good job, Molly! !